Wow...has it really been that long? I really didn't think it had been so long since I've posted! Jeezo-peezo...where have I been? That's a good question *wink* I've been SO tired the past couple weeks. I really haven't felt like doing much of anything. I feel very blessed though...I'd much rather be tired than having morning sickness. Thank the Lord! 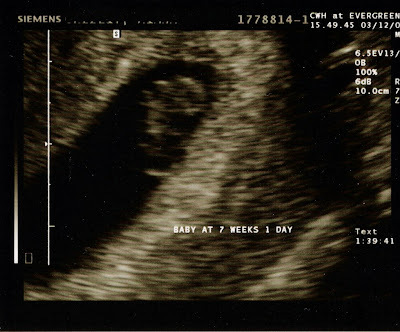 There is something really exciting I want to share...my baby's first picture!!! We went on Monday for our first ultrasound. We were told its early for an ultrasound (we're only about 8 weeks or so), so we won't really see much. But it was so reassuring to see the baby...heartbeat and all! Did you know that you can even hear the heartbeat with an ultrasound? I had no idea and thought it was super cool! Both DH and I thought it was a neat experience. So you can see above is the ultrasound picture! I'm excited and wanted to share with you!!! The lunch tins you see are now waiting for the final decorations to go on them. I've put ribbon on all of them but 3. Those 3 need a ribbon color that I don't have...I need to find a light aqua blue color (maybe a shade or so lighter than Cool Caribbean). I'm planning on adding an assortment of buttons, primas, bling to finish the embellishment on each tin. As far as decorating them with "recipes" or "cards"...I'm opting to NOT do that. My reasoning is this...the tins that sold well for me at the last craft show did not have either of those on them. Now, I did sell some of the ones that had "recipes" on them, but the ones with "cards" were still there at the end of the show. I'm really going with the intent of selling the tins, so I'm not going to add either to them. I think I have to agree with Taylor's thoughts she posted a long time ago at her blog www.tayloredexpressions.typepad.com She had some tins at a craft show she did last year and mentioned that people didn't go for the "cards" tins as much because they would not hold the "Hallmark" sized cards. As much as I would love for people to make their own cards...or even buy some from me *LOL*, Hallmark cards sell. Aren't theses Primas great? I participated in one of Jody's (texasjodylynn) shares and this is what I received!!! I just *finally* sat down to check them all out. I'm excited at the range of colors I have now. 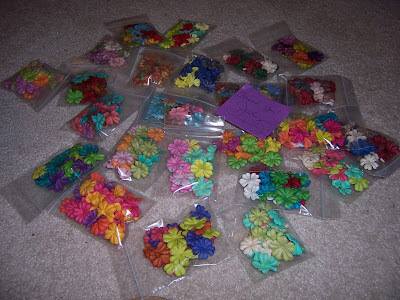 If I had to go buy all the colors myself...wow...big hurt to the pocketbook!!! But this is so cool...I got a sampling of 'em all. My first project with them? 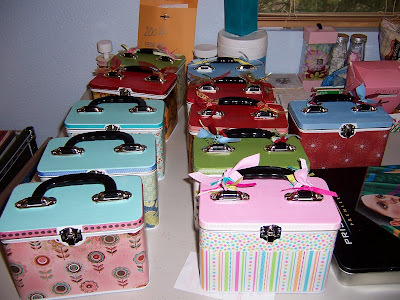 I'm going to use some to embellish the lunch tins I'm working on for the craft show I'm in. Maybe I'll actually use some on a card!!! I'm still working on finishing up my lunch tins for the craft show the end of this month. That's right, its the end of the month!!! Aaahhhhh!!!! I just need to add ribbon & embellishments to them and I can call them done! But...I still need to make up some journals, coasters, magnets, color me card kits & cards. I have a BIG to-do list ahead of me. I think there will be some nights spent in this craft room on mine. On another subject...I got my ribbon organized. Well, at least the ribbon that is on spools. I really like the storage option I chose. I'm hoping to post a pic of it later, so stay tuned! I'm still in need of organizing my cut ribbon...thinking about those nifty Cropper Hopper 3x3 storage drawers with the ribbon cards. What's holding me back is that I'm not sure where to store them....hmm. Hope you all have a spectacular day filled with blessings!